(+) Pros: - Probably the best free to play MMOTCG at the moment, - Incredibly well polished interface and great visuals, - Massive variety of heroes and cards allow for a ton of different strategies, - Doesn't focus too much on "pay to win" with the ease of earning gold, - Arena is a nice side distraction and allows for tons of ridiculous setups, - Addictive card collecting and crafting system, - Massive replay-ability. (-) Cons: - Some minor visual glitches now and then. I do enjoy online TCGs, especially the anime themed ones like "Sword Girls". I've been searching for a decent one for quite some time (not counting the mobile ones), but to no avail. Then "Hearthstone" popped up. Since it was based on "Warcraft", I wasn't too excited about it, and after seeing some videos online, I thought it was "alright". 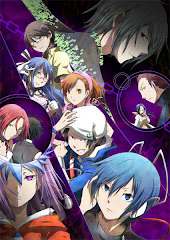 Then boredom struck and I went to download it...my god, I never once regretted that descicion. At the moment, "Hearthstone:Heroes Of Warcraft", is probably the best free to play MMOTCG out there, and for many reasons at that. It excels in its presentation, gameplay, visuals, and many more. For something that's free, you can't possibly ask for more. First, let's do a little bit of a case study. A MMOTCG is an online trading card game, simple as that. You collect cards, make a deck, and either play against the AI or other players. 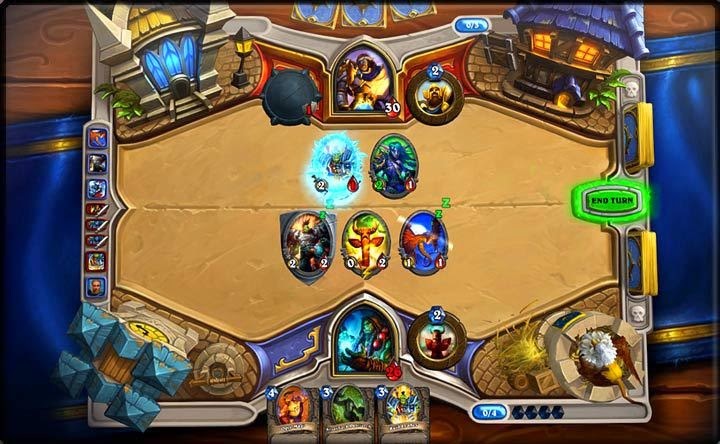 "Hearthstone" is based on "Warcraft", so if you played any of its iterations before, many of what you'll see will be familiar. 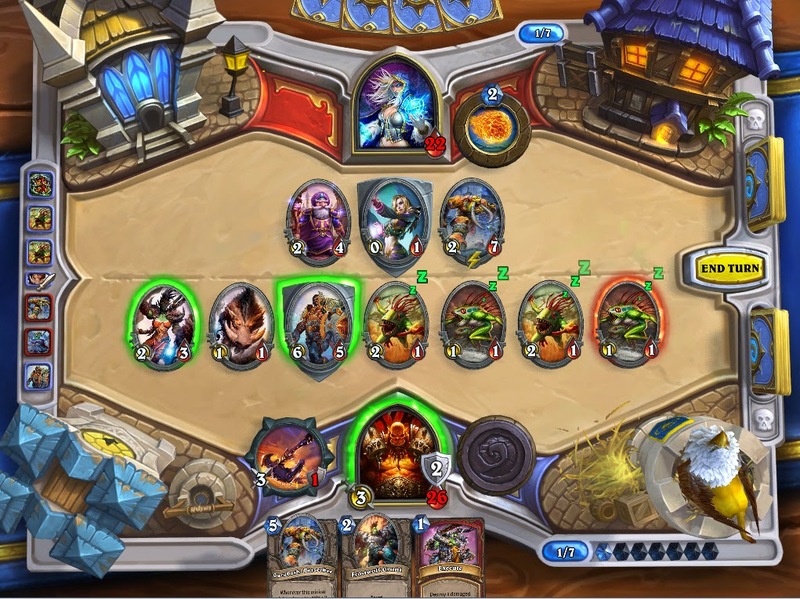 Compared to most other games in its genre, "Hearthstone" is downright fantastic. The interface is so well polished, the visuals are amazing, ranging from card designs to visual effects in game, like minions colliding with one another or spell animations. Even something as simple as drawing a card from your deck looks slick as hell. Let me explain how "Hearthstone" works. The closest thing that comes to mind is "Magic:The Gathering". Both players at each side of the board will summon minions to run into the enemy hero. Each player's hero has 30 health, and minions have attack/health values of their own. Running into the enemy hero until one dies is the way to go, but of course, the game isn't as shallow as that. When you take into account the individual minion types, their battle cries, the heroes, their special cards and special heroes abilities, there's a lot that can go wrong if you just plan to "smack an enemy until he/she dies". Plain old rushdown is good, but things can go wrong quickly against a mage. "Heartstone" is huge. Like, huge huge, its massive in the way that you can play it. Before you enter a match, you'll have to build a deck based on a hero that you want to play. Each hero has their own hero specific cards to build their deck with, as well as neutral minion cards that can fit into every deck. 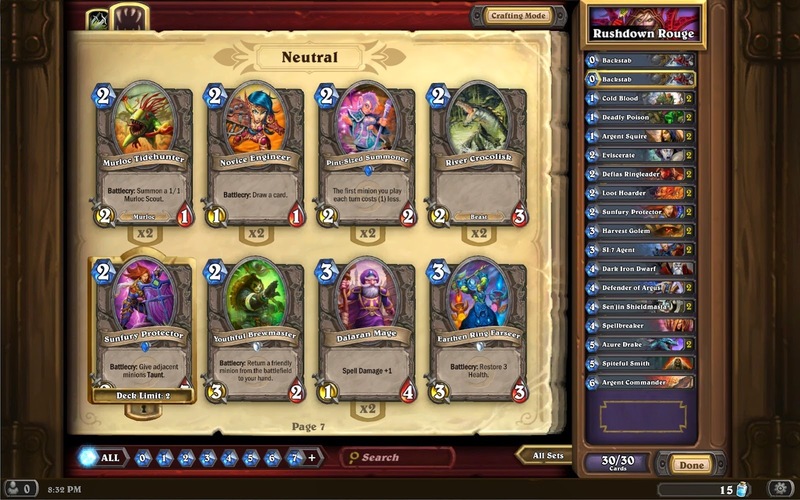 Each hero's own specific cards feature their own style of play and their own hero ability that can synchronize with how they want to deal with their opponent, and each hero needs to be dealt with differently depending on the match-up that they'll have, and each hero will benefit differently from different kinds of neutral minions available, the amount of combinations and strategies can be very overwhelming. For starters, different minions have different effects. Battlecries activate when you summon a minion, and these can range from drawing a card, dealing damage to an enemy target, summoning an extra minion or silencing something. Deathrattles activate when a minion dies, and these range a lot as well. There are extra factors to take into consideration, like taunt minions, which are minions that prevent you from damaging the opposing hero until you deal with them. Windfury minions attack twice a turn, while charge minions attack the moment they are summoned. And its not just the minions, different heroes deal with their opponents differently. The arena serves as another source of fun. Mages pin their opponents and minions down with freeze spells, as well as building up damage through spells like "Fireball" and "Pyroblast". They also clear the field well with multiple AOE clear cards, making them strong against heavy rushdown strategies. Shamans control the field with clear cards and buff cards alike, making their minions strong. Paladins focus more on the late game, while rouges are all about the early rushdown. Druids control the field and flow of battle to their favor and priests buff their minions to no end. Warriors take a mass focus on weapons and hurting their own minions for more power, hunters are most possibly the best heroes to use for turning around losing fights. Warlocks are just purely annoying with their minion massing. 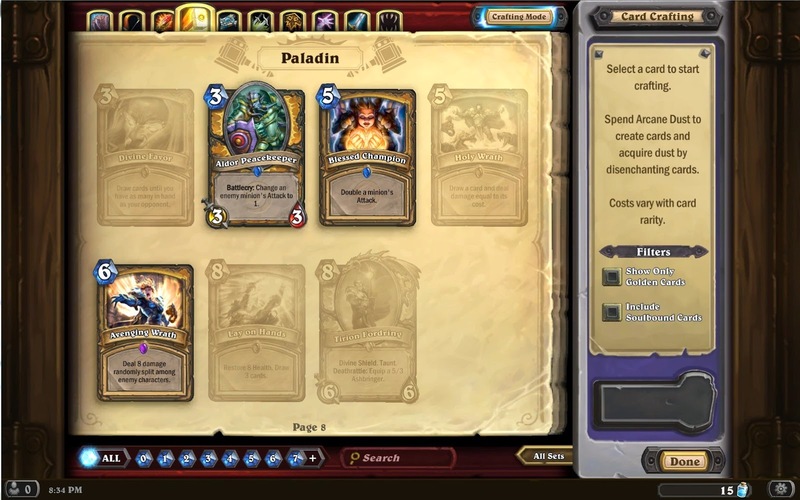 There's a lot of ways to play "Hearthstone", and everything is free to play, I literally mean so. Every day, the game pegs you with quests, and clearing these nets you gold. Of course, defeating players on a daily basis nets you gold as well, though you earn it that way very slowly. Gold from daily quests can accumulate for you to buy a pack, and by TCG standards, these packs contain cards for you to use in your decks. There are a lot of cards, and getting new ones might take some time, but that doesn't mean you can't use your own money to buy these packs. Its all about skill and strategy in the end, though having better cards DOES give you an edge of sorts. While endlessly searching for opponents through the game's effective match making system and crushing them is fun, there's another source of entertainment known as the arena. The arena is a mode that requires 150 gold per entry, which is rather expensive. 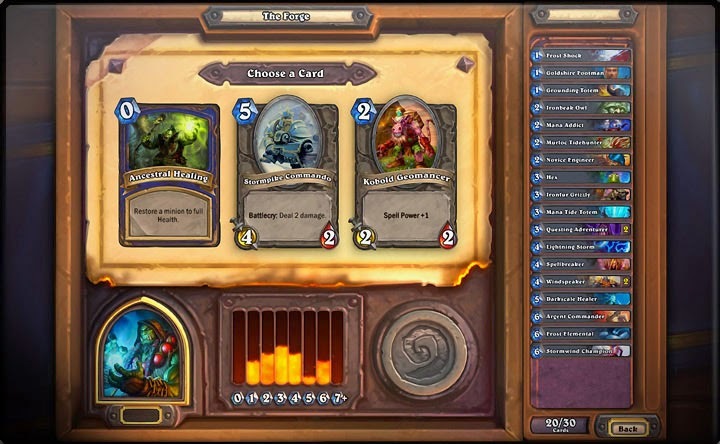 In the arena, you are given random cards, and you need to choose them. Keep choosing these cards being thrown at you at random until you have 30 cards for a full deck, and the game throws you into battle with this randomly made deck of yours against other opponents with their own randomly made decks. In here, you get to play with cards that you may never get to use (like legendary tier cards), and deck restrictions are removed, so you can have more than 2 of the same card, which can lead to many ridiculous situations. In the arena, consecutive wins lead you to better rewards to compensate for your 150 gold, and 3 loses means you're out. Without enough wins, you'll net a lost for your 150 gold, so winning more is ideal to earn profit. 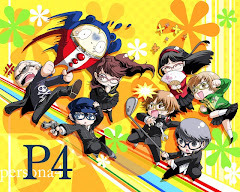 Needless to say, collecting cards to make the ultimate deck for your class is very very addicting. You'll constantly want to get those packs and see what they hold, and whether or not the new cards will be good for your deck. That's not all, if there are good cards that you DO NOT need, the game features a crafting system. You can disenchant cards that you don't need, giving you arcane dust, a currency you need for fusing cards. If you don't get the card you want in a pack, you can always accumulate arcane dust to fuse it in the future. All for the greater good and to create the ultimate deck that you so desire. 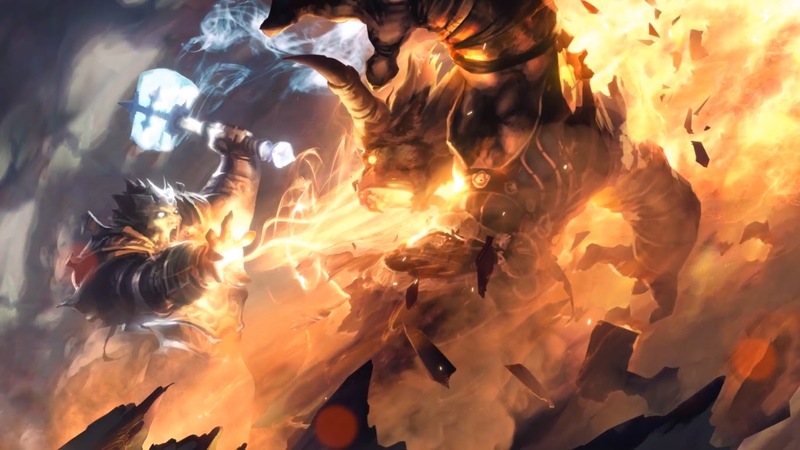 There's not much bad to say about "Hearthstone", because of how wonderful it is in its current state. If I had to point out, there are some minor visual glitches now and then. These aren't anything TOO huge, but to be honest, I've lost once or twice because of them. These glitches include card artwork being stuck ON the board during a match, making it hard to see your side of the board. You being unable to play a card you want because something is obstructing your hand...so on and so forth. These don't happen too often, but if they do, consider yourself unlucky. Some might screw you over big time, some are just annoying and can be gotten over with. Most of these glitches just remove themselves if you give them time. 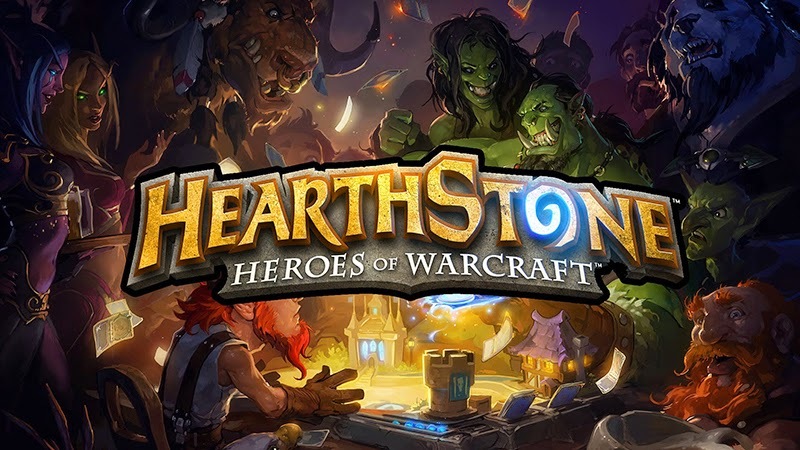 "Hearthstone:Heroes Of Warcraft" is an amazing free to play MMOTCG in its current state. 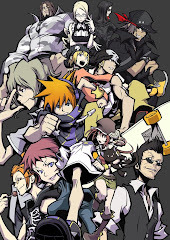 Addictive gameplay and the desire to craft or collect cards gives this game enormous replay-ability. The combinations are endless, and with 9 different heroes to play around with, you can really go all out in perfecting your skills here. The upcoming "Hex" looks promising, but I don't know if it'll be as good as this.